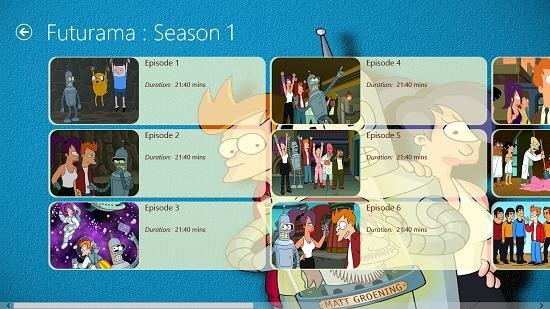 Futurama – Fun Unlimited is a free app for Windows 8 and 8.1 which allows you to watch the various seasons of Futurama on your device from legal sources. When you run the app, you will be presented with the main screen where you will be able to select the season which you want to watch. Following the selection of the season, you can then choose the episode from the season that you want to watch. Once that has been accomplished as well, you will be brought to the playback interface. Here, you will be able to toggle the playback via a playback bar at the bottom of the screen. This bar hides automatically. The app is well designed and works smoothly. You do require an active internet connection to make full use of this app. Futurama – Fun Unlimited is available for free from the Windows App Store. The below screen is presented to you when you launch the app. In the above screen you can choose the season which you want to watch. When you have chosen that, you will be brought to the episode selection screen. You can choose the episode from the above screen. The screen is sorted neatly in a scrollable manner and makes for a nice way to select your episode while being sorted categorically. Once you have chosen the episode that you wish to watch, you will see the below screen which is the playback interface of the app. The playback interface shows the playback bar at the bottom which allows you to toggle the playback settings, seek, play, pause, stop, change player size, remove ads etc. Choosing to remove ads costs real money, but as the ads are non obtrusive and are present on one side of the screen and don’t hinder playback, this is truly optional. 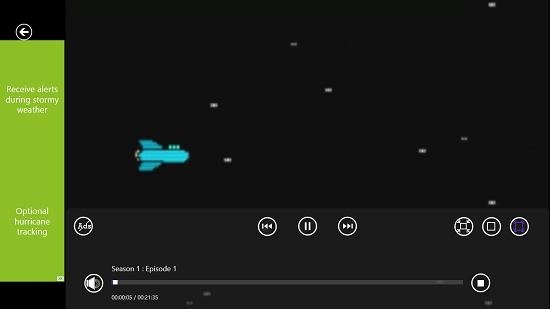 The playback bar hides automatically in a few seconds but if you hate to wait, you can click on any empty area in the player and the bar will hide. Simply right click to bring up this bar again or swipe up from the bottom on a touch screen device. You can see the playback bar minimized in the screenshot below. You can return to the previous screen at any time by clicking on the back arrow button at the top left of the screen. this winds up the main features of the app. 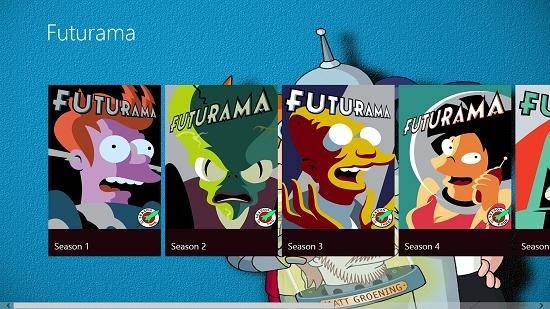 Futurama – Fun Unlimited makes for a good download on devices running Windows 8 or 8.1 if you are a fan of the Futurama series. You can grab it for your device from the link below. 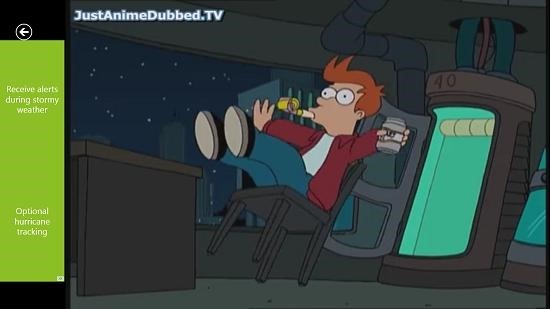 Get Futurama – Fun Unlimited.